The East Coast could be the place to be this weekend. The low that gave us the great easterlies for the last week or so has reduced in intensity and lies just to the northeast of Northland. A low pressure system is strengthening in the south of the Tasman Ocean and this has a high pressure zone sitting on top of it. The westerly flow should strengthen in the South Island first, so those who have been waiting to fish from Birdlings Flats or Kaikoura should have an opportunity starting on Friday and it looks like it will be a 3 or 4 day blow down south. The westerlies should arrive at Wellington by Saturday so places like White Cliffs and Castlepoint may be the place to be. North of a line from New Plymouth to East Cape it may go calm until late Saturday but by Sunday the winds may pick up from the westely quarter, it depends on which way the high moves. This could be good news for the fishers from the Bay of Plenty to North Cape who have had the wind blowing in their faces for the last week. The westerly flow should prevail over the whole of the North Island by Sunday if everything leeps moving the way it is. The fish are in on the east coast so most east coast beaches should fish well if the wind rises. 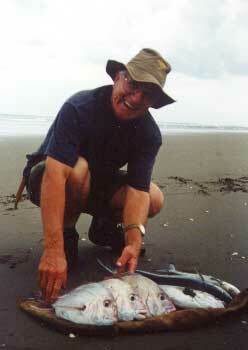 Ken Hoffman fishing Bethells Beach, Sat/Sun 9th & 10th. 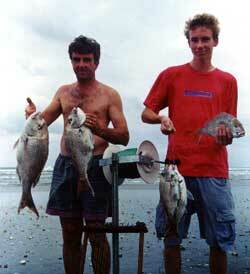 Caught 1 snapper, 1 trevally, 1 gurnard and 1 john dory on the Sunday and 3 Snapper on the Saturday. 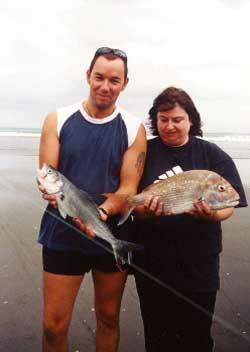 Mike Hurlena fishing Tangimoana with a Bottom Longline on 11/3/02. Caught 5 gurnard and 1 kahawai using squid bait. Hot off the press, talked to a customer last night who reported huge snapper being hauled in all week from the Mokau/Awakino area. He witnessed one of the better catches, 4 snapper taken on one set with a Bottom Longline Rig. He estimated the weights were 28lb, 25lb, 22lb and 15lb. Ron Wilson reports this area has been very disappointing over the last week. Just a few sharks and gurnard being caught. We didn't hear of any snapper being caught in the area over the last week. Even boaties were reporting the fishing was poor. Obviously all their fish had travelled north of the Manukau Heads for the week as that was where all the action was happening. Raglan to Kariotahi usually fishes best later in the season, so don't give up on it. 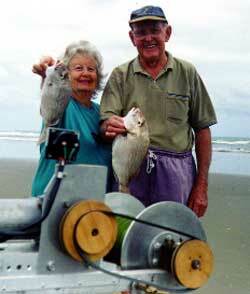 Peter and Barbara Martinovich were using a Large Dropper Rig baited with squid at Muriwai Beach. While their first set was nothing to write home about, their second set returned with just one fish, this 17 lb snapper, the biggest we saw on the day. 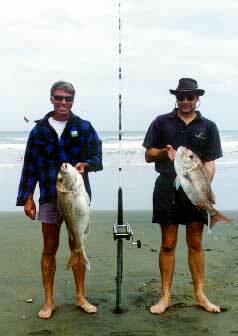 Dennis Hart and Ray Thomas were fishing Muriwai with a 25 hook Bottom Longline Rig using salted mullet baits. Their first set returned 1 kahawai and 5 snapper. 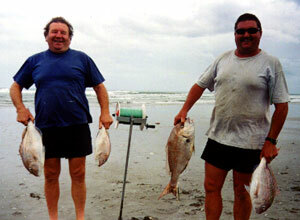 Dennis reported that during last months easterlies he caught 2 snapper around 15 to 20 lbs from one set at Muriwai. According to Dennis "I've tried several other brands of kites and Paul's is definitely the best and most reliable". If there was ever a weekend to have a kitefishing rig, this was it. The Kitefishing Club had their monthly demo day at Muriwai Beach and it was one to remember. Trish Rea from Paul's Fishing Kites spent the day with the Club, while Paul and Peggy Barnes from Paul's Fishing Kites drove up the beach from the stream to 2 kilometres north of Rimmer Road interviewing kitefishers and photographing their gear and catches. Bodo Luckfiel, fishing 5 hooks with his Flexiwing Rig at Muriwai landed 2 kahawai and 1 snapper from his first set and 2 snapper and 1 kahawai from his second set. 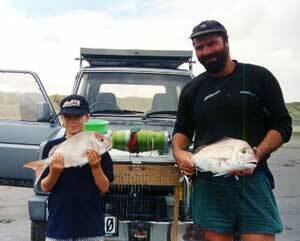 Gary Codyre and son were catching nice snapper on their Bottom Longline Rig at Muriwai. The winch in the background utilises a wheelchair motor to drive the 12mm thick reel spool. This particular winch has a very small diameter spool and is quite long to provide sufficient capacity to store the 1000 metres of 100 kg mainline plus kiteline and flag. Steve Bailey and his son Col, also running a Longline Rig, baited up with trevally on their first set which returned 1 kahawai and 7 snapper. Using the freshly caught kahawai from the first set, Steve baited up the second set and landed 10 good sized snapper. 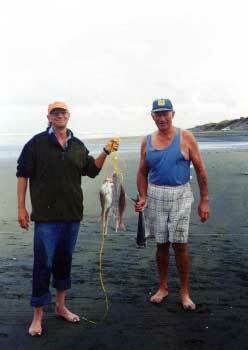 Kite Club weighmaster David Billings set his Longline out baited with mullet near Rimmers Rd. David has a 2 kilometre rig and on Sunday he set the gear out to around 1100 metres offshore. David's first set returned with 2 snapper, 2 gurnard and 2 kahawai. His second set returned 1 kahawai and 9 snapper up to 4 lbs. 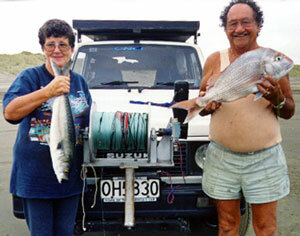 Kite club members Neville and Maeve King making life easier with their electric winch on Muriwai Beach. The winch has a baiting table and they also have a trace rack with extendable legs that press into the sand. John Dennis and son Ian are newcomers to kitefishing. On their 4th attempt with the Bottom Longline Rig they set 25 hooks baited with mullet off Muriwai Beach. Their catch was several nice snapper up to 4 lbs and a couple of kahawai. 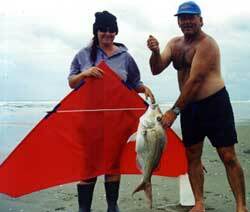 Gary Sherman and Stephanie Hill fishing at Muriwai Beach ran 2 sets with their Bottom Longline Rig. Their catch, 5 snapper and 1 gurnard on their first set and 4 snapper up to around 12 lbs on their second set. Anthony and Louise Musson have been kitefishing for 6 years. Using a Flexiwing Rig and setting 5 hooks baited with mullet they caught a 4 lb snapper and a kahawai from their first set. Anthony says "I've got just about every one of Paul's kites and rigs and I enjoy the Flexiwing Rig the most". Mark Roberts and Tim Gerrard showing Tim's two snapper taken on a Flexiwing Rig run from a 9/0 Daiwa reel spooled with spectra. The catch was taken close to Rimmers Rd. Tim's fish of 12 lb, was the biggest caught by a club member on the day. Jim Birch and Beatrice Keay using salted mullet on their Longline Rig pulled in a mixed bag of snapper, gurnard and kahawai and wound up with 19 fish from two sets half way between the creek and Rimmers Rd, Muriwai. Robin and Heather Stanley of Massey were fishing a Bottom Longline Rig baited with squid. 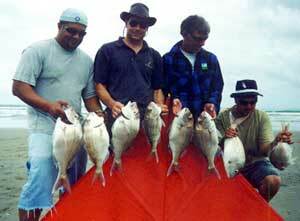 Last Saturday they caught 3 snapper and 3 kahawai. Robin is a boat builder by trade and says "kitefishing is great, it has paid for itself over and over again and it's cheaper than buying a boat". Kite Club member Eric Easton was fishing with a Longline Rig and caught 8 snapper using whole salted baby mullet. During last months Kite Club demo day Eric landed the largest snapper which weighed in at a respectable 20 lbs. Ray O'Connor and Val Herzog reported that during the last Kite Club day they pulled in a 20 lb snapper on their Bottom Longline Rig while using squid baits. They were just setting up when we stopped to chat so had nothing to report at the time on Sunday. 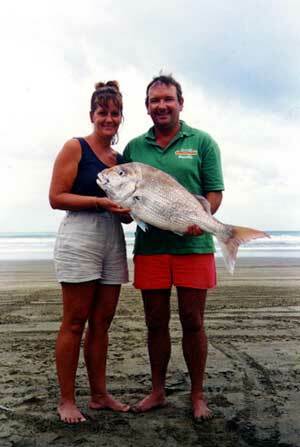 David Stone fishing at Waitere near Levin caught 14 snapper in this weeks easterlies on his 65kg Dropper Rig. Howzit Guys, The name is Lomax and I have had a rig of yours for about a month and its had 15 visits to the sea's since. Im posted to Linton Camp and travel each weekend or maori-day-off to where-ever the wind is "TOO MUCH !" Hawkes Bay three weeks ago ...Kawhai and cod...no snaps though. Cruised over to Matakana Island two weeks ago....wicked bite-times!!!!! ...10 snaps in half an hour..with rods 40m from our feet!!! Bloody wind was westerly so couldn't set it out at Ocean Beach. I had to put the rig out in the Tauranga Harbour. We scored kawhai and two Stingrays. Last Weekend no good at Himatangi although the wind was supposed to tend east but failed to until Monday. One honest days work on Monday then the boys and I scored a day off. Himatangi was on fire! First set 5 Gurnard and 3 Kawhai which had been bitten by some big bugga!!! Second set 4 Gurnard , 2 Kawhai and a Giant paddle Crab .....that was enough for a munch and we split. Was a strong Easterly and the kite just sailed out there man....first set out to 1200m in like 13 minutes. The flag didn't even get wet !!! Schools of fish were thrashing around from about 400m out to a good kilometer, Birds were going mad ! I use a 100kg bottom line rig, with the crimps and sliding trace do-dacky, I tutu with flashers, float balls and Beads when I replace damaged traces ....works ok.....I want to nail the snaps and am looking forward to cruising to Matakana Is. over Easter. My mate Tip is my 2IC (second in charge) and we have things sussed !!! Sorry,no pics team, too poor for a digital camera, soldiers don't get paid a hell-of-a lot! Hi Great site. Could spend a lot of time reading all the articles, and probably will! We are new to kite fishing but thoroughly enjoy it. We got into it after buying a kontiki and losing half of the line in the surf at Muriwai, real amateurs then! After converting the kontiki rig to a kite rig using a nighthawk and small sky hook we have had more success. We have fished Pakiri, great on the incoming tide, Hatfields, OK but pretty small, Orewa, again pretty small and no one was having any success both times and Muriwai where we have mostly caught sharks. Have convinced my wife that to get better catches at Muriwai we will need to drive up the beach. She was a bit reluctant as the all wheel drive Subaru Forester is her company car! Last Saturday we fished Muriwai South arriving about 9:00am, just before high tide. Because of this we left the car in the car park and walked down to the beach. Because we walked we fished almost straight down from the entrance. Put the kite out retrieved after about 20mins, 1 sand shark and 5 baby sharks. Reset, retrieved again 20 mins, 7 baby sharks. Reset, retrieved 20 mins, 8 baby sharks. Gave up. Took 2 sharks home tried one as raw fish very good, the other one salted and left it overnight and smoked for lunch Sunday again very nice. My daughter also took one home and smoked that night but tasted like chlorine. Yuk! Keep up the good work. I will report regularly as we try fish at least one day a weekend. During a recent phone call we received a report of plenty of good snapper up to 55cm long have been taken off the rocks at Maritai. The fisher was using a handspool and hand casting 40 to 50 metres out in the evenings.